An artist's rendering shows how one Dallas intersection could be revamped for walkability. That same intersection today, without any pedestrian-friendly amenities. Dan Burden leads the Walkable and Livable Communities Institute, a non-profit in Washington State. 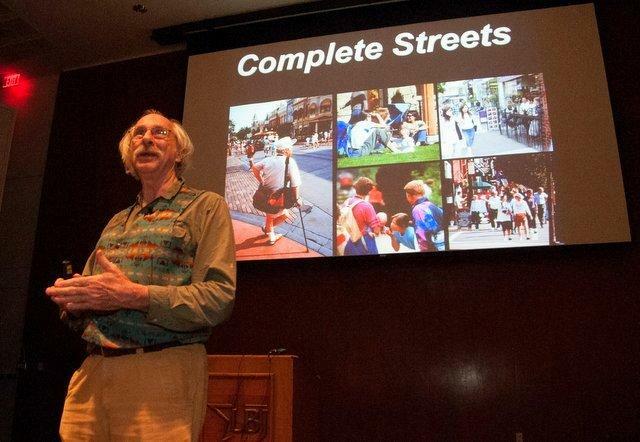 He is also a walkability expert scheduled to meet with Austin officials. As he stands at the corner of Burnet and Koenig streets in North-Central Austin, he measures everything around him. Dan Burden speaking in Austin earlier this week. The corner of Burnet and Koenig is a bustling four-way crossroad. Lamar Middle School is right there. So are an H-E-B and several little shops. The Texas School for the Blind is nearby. So dozens of people walk through that intersection everyday. Some are visually impaired. At each of the crossings, Burden measured the width of the sidewalks, and pointed to some of the pedestrian dangers. In cities like Vancouver, Portland and San Diego, the walkability concept is old news. But things are different in Dallas. Mary Grinsfelder is with the Community Council of Greater Dallas, a non-profit that is spearheading the movement to make Dallas more pedestrian friendly. It's also working with Dan Burden. On his first visit, Grinsfelder and her team picked a part of town where five streets converge in a mostly immigrant neighborhood. She says Burden “was able to come in with some very practical, not incredibly difficult to implement, next steps that could transform that area into a much immediately safer environment. But [he] also showed us ways that there may be opportunities to spur economic development.” Voters in Dallas just approved a bond package for this project. The idea of walkable neighborhoods is an idea that has caught traction in mostly affluent neighborhoods. But, as the population in Texas continues to grow, Burden says walkable areas are the cheapest way for cities to expand. A handful of state legislators have demonstrated to have some to introduce Burden's ideas to other Texas cities, and Burden is meeting with them this week. When it comes to Austin architecture, the Seaholm Power Plant is about as iconic as it gets. But absent its art deco signage and smokestacks, there’s another component of Seaholm that’s less celebrated but even more unique: the intake structures perched directly over Lady Bird Lake, which used to deliver cooling water to the power plant and a since-demolished water plant nearby.